Are you based in Whitley Bay or the surrounding areas? Do you have a conservatory? Or are you looking at conservatories in Whitley Bay? An important factor to consider when it comes to conservatories is the roofing. We are one of the leading providers of the patented Guardian Roof Whitley Bay. 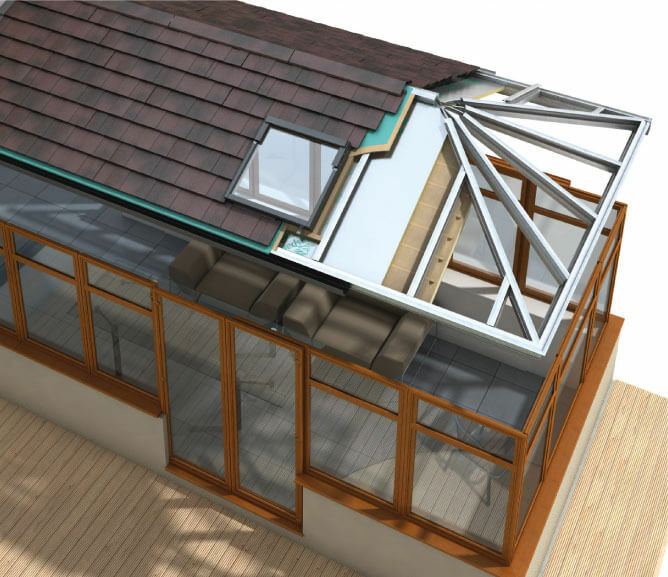 For more information about whether a Guardian Roof is right for your conservatory, read on. In the past, older conservatories with glass or polycarbonate roofs have experienced serious issues. From problems with temperature, lacking energy efficiency, difficulties with soundproofing and general wear and tear, they simply weren’t fit for purpose any longer. Have you ever sat in a conservatory in summer, feeling as though you were sweltering in a garden greenhouse? Or in winter, have you wished to sit comfortably in the conservatory, only to find yourself buried under multiple layers and several thick woollen blankets, clutching a hot water bottle, before finally retreating to a warmer room, whilst the conservatory sits unused for months? Sound familiar? A Guardian Roof, with its advanced technology, is the perfect solution, meaning you can use your conservatory all year round, really making the most of your space. standard conservatory roof, meaning it can be added to most conservatories, without the need for additional structural reinforcements. Before installation, however, a survey will still need to be undertaken to determine whether a structural solution is needed. Ventilation within the Guardian Roof allows air to flow freely, preventing moisture from building up which leads to staining and mould growth in other older conservatories. This will ensure your conservatory stays dry in all weathers. The temperature inside a Guardian tiled roof conservatory is regulated thanks to high performance insulation, which is extremely energy efficient, as well as allowing you to benefit from your conservatory during any season. Thanks to the regulated temperature, the economical Guardian Roof has been proven to help our customers save money on their heating bills. The Guardian Warm Roof system is fully tested and approved to the highest standards. Our Guardian Roofs in Whitley Bay come with a 10-year warranty, giving you peace of mind as well as satisfaction with our high levels of quality. Our team are always on hand to come out and fix any unlikely issues that may arise. From Whitley Bay to North Shields, we provide outstanding quality service, fitting Guardian Warm Roofs quickly and efficiently, to the delight of our many happy customers. With over 30 years of experience, fitting everything from windows and doors, to conservatories and orangeries, we have the expertise to ensure your conservatory is finished to a high standard. If you are looking at conservatories in Whitley Bay, or thinking of updating your current conservatory roof, consider a Guardian Roof. Energy efficient, engineered to a high standard and quick to install, a Guardian Roof in Whitley Bay is the only choice when it comes to conservatory roofs. We are a trusted and reputable Guardian Roof installer. Our helpful, friendly team can advise you and provide you with a detailed quote. Contact us today on 01670 710050 or visit our showroom. You can also visit our Guardian Roofs page to receive an estimate and find out more information.